personal health record | Get There! If you receive s ervices at CSTS, you know that somewhere, somehow there is a paper trail that has your name on it. Well, remove the mystery and check out what has now become an electronic record called the Community Electronic Health Record (CEHR). You can use it to access your personal CSTS health record from any computer with an internet connection. Access to the CEHR are available through kiosks placed in the waiting rooms at the Towner, Ellsworth, and the Annex building (PORT). The personal health record or CEHR is really a cool tool. Not only can you see the diagnosis codes used (can anyone say Google?) , but a person can keep track of their own vitals and lab reports…how many times do we go in for tests and never hear anything back? With the CEHR, a person has more of a feeling of control. You can see and update yours or your emergency contact’s information, as well as see your upcoming appointments, reported allergies, demographic information, and the current medications that you are on. Besides the kiosks look kind of like an old school arcade game. You may not be able to rescue the princess or cross a busy road, but a person can make it a challenge to lower their bmi or track their sugar levels. All without a quarter! By the way, protecting the confidentiality of your records is top priority – the only information a person will see will be their own. 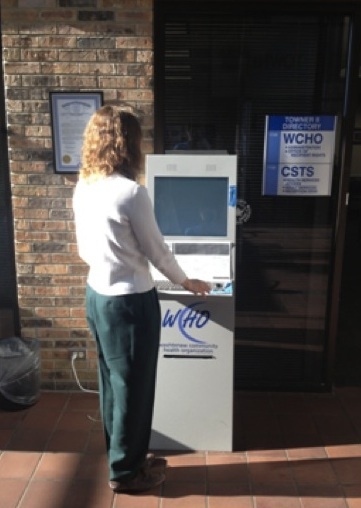 Ask for your private login at your next CSTS appointment!